and gives a group of Cub Scouts something to remember. In a pilot’s life there is said be a defining moment where the culmination of events inspire and foster the desire to fly. 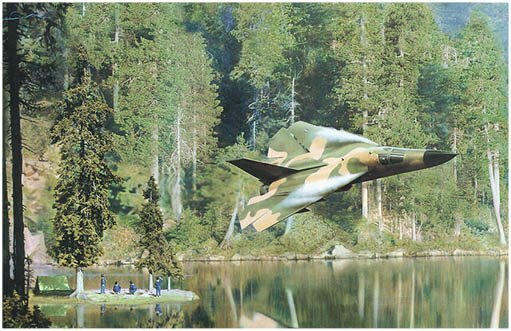 Usually the interest stems from childhood, and this F-111 depiction by Dru Blair makes no exception. Set against a beautiful lake, a group of Cub Scouts bears witness to an awe inspiring event that will be remembered and cherished for the rest of their lives: a low level pass by an F-111. Lasting but an instant, the passage of the great jet leaves in its wake a permanent inspiring image, and plants the seed of a life-long love of aviation. Deemed "Aardvark" due to its prominent proboscis, the F-111 remains one of the most capable, if controversial aircraft in aviation history. Brutally fast, the F-111 pioneered the advent of low-level penetration at high speeds during the Vietnam war. Although the US Air Force recently retired the F-111, the Australian Air Force still operates and maintains the aircraft. "Timing is Everything" is limited to 950 Signed and Numbered high quality Lithographs. Reproduced on 100 lb. Archival Stock. Each print is signed, numbered and inspected by the artist to ensure quality and color consistency. Supply is strictly limited to availability. Price $125 USD.